The challenges facing owner-led independent businesses are unique. They are caught between the well-known brands with unlimited budgets for digital marketing strategies and young up and coming unknown brands that are just far more digitally savvy and agile. With so much competition it’s not uncommon to feel like you are just missing that piece of the puzzle; that key that will take you and your business to the next level, build that traction and get your brand seen. The Align Principle will help get you back to being creative rather than firefighting. You are not alone, and you have come to the right place. We solve these very challenges through a powerful 5 step fashion brand alignment method to help you navigate through this challenging yet exciting time, seize future opportunities and unlock your brand’s hidden value. 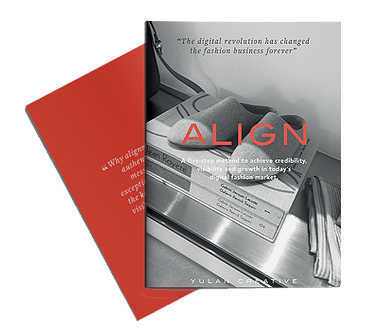 The ALIGN programme is a unique six-month accelerator programme that is designed for ambitious fashion business owners looking for support and industry expertise to grow, scale or pivot their business to become a known and respected brand. It fast tracks you to the insights critical to building the framework of a long-lasting, strategic fashion business, by applying each of the steps of the method through a blend of training and exercises. We support you all the way with high-quality, individualised expert feedback from our team of industry experts. Raise your credibility by applying the successful key principles of fashion brand alignment to your business. Create market cut through with a laser-focused unique brand story linked to a distinct visual language. Transform ordinary products into the exceptional, win more customers and grow your business. We are a multi award-winning consultancy with 20 years of UK and international expertise dedicated to helping owner led businesses to navigate and solve these very real challenges. Our powerful five step fashion brand alignment principle helps you seize future opportunities, unlock your brand’s hidden value and grow. Who is the ALIGN Programme open to? We work internationally with the decision makers and owners of established and up and coming mid to luxury businesses who have traded for 3 years or more. Founder, Joanne Yulan Jong will work directly with you delivering the modules and supporting your journey. During the 6 months, you will be introduced to targeted industry experts in our formidable network of partners. How long is the ALIGN Programme? The programme is designed to be 6-months to fit alongside the workload of running your business. For those who have more time to dedicate, we do offer a 3-month compact version. We work closely with business owners over the 6 months delivering the five key modules of the ALIGN principle. Each module takes a month and kick-starts with a 1:1 London based (or virtual) meeting, with phone calls or bi-weekly video calls to support you throughout the programme. Our programme workbooks contain questions and rigorous exercises that have to be carried out according to a structured workflow and schedule.You will also have access to, and meetings with our network of experts in targeted 1:1 FOCUS sessions where we concentrate on key issues holding you back. Since working through the ALIGN programme, both Helen and I have found so much more conviction and clarity. The exercises are very well designed to draw out our story and purpose in the clearest and most authentic way possible. Joanne has really helped us focus on the essence of our brand and highlight the key factors will dictate the level of our success. The real surprise has been how incredibly empowering and joyful the experience is. DO YOU WANT TO KNOW MORE ABOUT ALIGN AND WORK WITH A HIGHLY EXPERIENCED FASHION CONSULTANCY THAT’S DEDICATED TO MAKE YOUR BRAND SUCCEED?